The Royal Orient Train is a popular luxury tourism train which operates between Rajasthan and Gujarat, covering some prominent tourist destinations of these two states. Design based on the well known Palace on Wheels, this train is India’s first luxury passenger train which offers a taste of luxurious royal life while also reflects the best of heritage and culture of India. Started in the year 1994-95, this train is a joint venture between the Indian Railways and Tourism Cooperation of Gujarat. The livery follows a particular blue scheme so as to differentiate it from popular palace on wheels. This train didn’t do much well in its initial years as the passenger occupancy dropped from 25% in the first year to 15% in the following years. But after a revamp in the year 2007, things worked fine and the train started generating profits. The train has 13 coaches of which each one has a distinguished character. These coaches reflect the earlier kingdoms of Rajputana in their whole splendor. The coaches are tastefully adorned and are very comfortable together with attached washrooms. These cabins are designed for accommodating three people but generally just two passengers accommodate in each cabin as they prefer privacy. The Royal Orient Train also has a great bar which is called the “watering hole” that serves heady blend of whisky and wine together with appetizers. This train has two multi specialty restaurants also which serve different continental, Chinese, and Indian cuisines together with conventional Rajasthani and Gujarati food. The train also has a library where one can find a longue that gives impeccable view of the countryside together with an unparallel reading pleasure. The Royal Orient Train has one more longue which gives spectacular view of the countryside when travelling during day time. This longue has a VCR and TV for entertainment purpose. The Royal Orient Train also has a team of personal livered attendants who are always ready to take care of passengers while wish them with a whim and smile. The coaches of this train are comfortable and well furnished having the maximum capacity to accommodate two passengers in each cabin. A well equipped cabin is always attached with a washroom that has cold and hot water every time. Amongst the other services on board, there are attendants in each particular saloon where the services can be accessed 24*7. These cabins also have an emergency 1st aid kit together with a doctor which is available on call at any nearest railway station. The train has two restaurants which serve blend of continental, Chinese, Indian, and Gujarati cuisine. Breakfast is offered in the cabin itself or in the longue. The snacks mentioned in the menu can be ordered round the clock in the cabin. The contemporary pantry offers non vegetarian and vegetarian snacks together with cold and hot beverages. The bar of Royal Orient Train is well stocked with good quality and finest scotch along with Indian vodkas, rums, wines, liquors and malt whiskies. Beer is too served at the bar while can be ordered in the restaurant or in the cabin. A longue in the train is made with intent to provide the passengers with a place where they can sit, and get entertained. This longue is 14 air conditioned and is exquisitely decorated. The longue is furnished with VCR and TV while each of the cabin has a music channel with speakers which can be played on demand. The train departs from Delhi Cantonment at 3pm. Dinner is served on the board of the Royal Orient Train. The train reaches Chittorgarh in the morning. Then a visit to Chittor Fort is organized which is located on hill top while covers 240 hectares. This fort is a testimony of the valor, culture, and bravery of Rajputs. Following the breakfast, the train moves towards Udaipur which is a heritage city in Rajasthan. This offers an impeccable blend of exquisite natural beauty and heritage. Further this is followed by sightseeing and Lunch in Udaipur. Dinner is served on the board of The Royal Orient Train. The train arrives at Junagarh. Here there are some prominent places to visit. These include – the rock edicts of Ashoka, the Darbar Hall of Museum, the Mausoleum of the Nawab Mahabat Khan and many other. The third day ends with a visit to the Somnath temple which lies on the edge of Arabian Sea. On day four, the tourists visit the famous Gir Lion Sanctuary which is the sole remaining habitat for majestic Lions of Asia. Then is the time when the tourists must visit the Dilwara, well known for its beach at Mandvi and Ahmedpur. The other must visit are the St. Paul’s Church and the Diu Fort. Dinner is again served on board of the Royal Orient Train. On day five, the train reaches Palitana where a trip is organized for visiting the exquisite and popular Jain temples. This train further takes the tourists to Sarkhej, where the tourists shall visit Vishalla Village and get a feel of local traditions and customs. Then the tourists can take a bus for Ahmadabad. Ahmadabad is another tourist delight since old and new move hand in hand here. The major tourist attractions include Calico Museum of Textiles, the Sidi Sayyad Mosque, Adalaj Stepwell and the Gandhi Ashram. Dinner is served on board of Royal Orient Train. Soon after having the breakfast, the train takes you to the exquisite and natural countryside since the tourists roll into Jaipur. Jaipur is a pink city which was discovered by Swai Jai Singh II. The tour of this city shows it glory. The first stop is at the Hawa Mahal – an icon of Jaipur. Then the tourists move towards fort Amber while also experience the elephant ride. This ride helps in checking out the architecture and museum. Further the trip extends to visiting the City Palace and Jantar Mantar. The tourists also have ample opportunities to shop. Dinner is served in the train itself. Breakfast is served in the train. The Royal Orient train now reaches the Delhi Cantonment Railway Station putting an end to the amazing and refreshing journey. Child below the age of 5 years is permitted to travel free while the child between 5-12 years is charged just 50%. 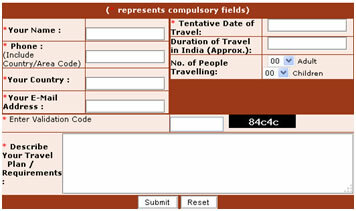 Surcharge is charged @10% during Christmas and New Year. Child between 5-12 years of age is charged 50%. The child is allowed to travel only if accompanied by parents. April and September fares are offered at discount. Tariffs are subjected to change without any prior notice. Expenses of personal services like laundry etc. The cancellation should be emailed, faxed or must be given in written to the concerned authorities. The refund shall be given after making the following deductions.